UK Finance sponsored the creation of a public cloud computing framework that sets out best practice for the procurement and ongoing management of cloud computing as a service. The target audience for this framework is any fi nancial service provider and it will be particularly helpful for the technology, risk, vendor management and procurement functions within institutions. The controls have been derived from analysis of UK Finance members control sets and in collaboration with cloud service providers. Each control has been cross checked for compliance against ISO 27001, COBIT 5.0, Cloud Security Alliance Guidance, AICPA SOC 1 and EBA Cloud Outsourcing Guidelines. 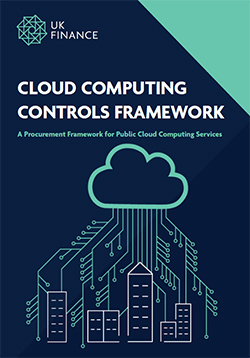 The framework consists of 44 controls, each control is mapped to one of nine domains and one of eleven risks associated with the management of cloud computing as a service.